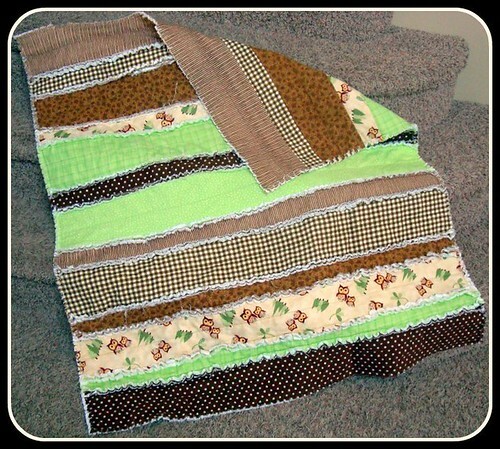 This week, I finished a very cute rag quilt for my neighbor. She had picked out the fabrics, started sewing, and never finished. I asked if I could finish it, and I love the way it turned out! 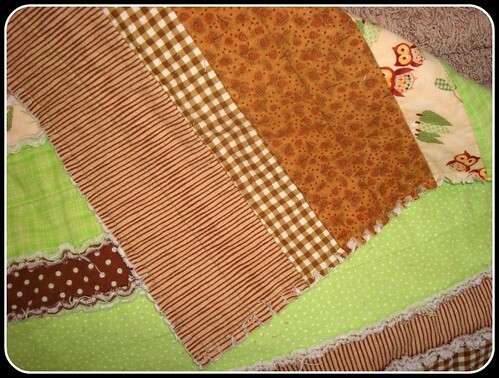 Strip rag quilts are super fast and easy. 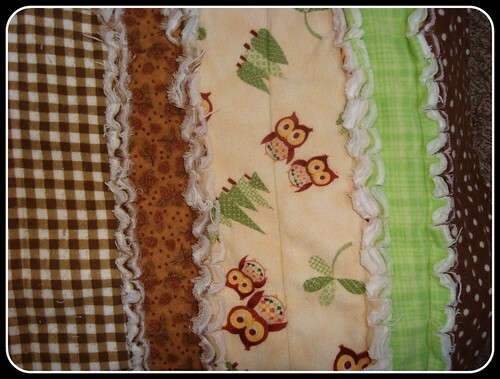 They are a great way to use up your flannel scraps. 1. Plan the layout. Raid your scraps to see which ones you want to use. Decide if all strips will be the same length or not. They are all the same width, which is the width of the bolt of flannel (usually 44 inches). Remember, each strip needs to be matched up with a strip of the same size for the back of the quilt. 2. Two or three layers? In the quilt pictured, there are three layers. There is a layer of white flannel sandwiched in the middle. If you do three layers, you will cut strips of the middle layer to match exactly the length of each strip. For example: For a 4-inch strip, you will have one 4-inch strip for the front of the quilt, one solid 4-inch strip for the middle of the quilt, and one 4-inch strip for the back of the quilt. 3. Once you have the quilt all planned out and the layers assembled, start sewing! Use a 1/2 inch seam allowance. All seams face the top of the quilt. Right-sides face out. 4. Most likely, the strips were not exactly the same length (some may have been 43 iches long, others may have been 45 inches long), so the sides of your quilt will be uneven. Go ahead and trim it to be straight on the sides. 5. Top stitch around the whole perimeter (outside edge) of the quilt to hold it all in place. 6. Clip all seams. I usually clip every 1/4 - 1/2 inch. 7. Wash the quilt. After washing, I take it outside and shake it a few times to get most of the strings off before drying. Make sure your lint trap is clean before drying. And clean the lint trap again after drying. It will have a lot of strings on it. You will notice that the bigger strips in this quilt have a stitch down the length of the strip. That is how my neighbor wanted it. You can do that or not - it's up to you. 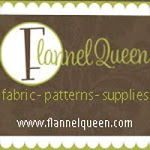 Grab a remnant bundle from Flannel Queen, and get to work on your strip rag quilt! I made it and it came out beautiful!!!!! Thanks for the detailed instructions! I am going to have to buy the flannel. Do you have any amounts to give me? What is the length of the quilt? This quilt is approximately 44" wide and 60" long. It's been awhile since I worked with this quilt, but I think the narrower strips were 3" and the wider strips were 6". Make sure you buy fabric for the front as well as the back. Thank you so much for your awesome website. This is such a beautiful quilt. We are working on a surprise project and this page has really inspired us and helped us firm up our plans. Keep up the great and creatively beautiful work! Cheers!!! cutter, do some basic math and sew a straight seam - presto, you are now a 'quilter'! You'll make little mistakes along the way, and you may change your approach here and there as you find 'your own way ' with the whole process. But with a little tenacity and some determination...success can be yours. You might start with a baby or lap quilt, just to get your feet wet. Or even a set of place-mats??? Good strengths! The quilt above is quite lovely! Thank you for taking the time and effort to share.